Basil is one of the oddest felines I’ve ever met. As an aging cat, he’s slowed down some, but what’s always true is he’s unique. He allows very few into his personal space, and I’m honoured I got to be one of the selected few. For friends and caretakers, I wanted to make this short 20-plus page photobook highlighting his “ornery” character and how he spends his sleepy days. I wanted something tangible and on record showing he was around to enrich my friends’ lives for many years. I photographed Basil in Sydney, Australia from March to May 2013. The first time I met Basil was in 2002 in the German university town of Heidelberg. Whenever my friends were on travel, they asked me to stop by their apartment and to ensure Basil had enough food and water. Occasionally, the encounters were fraught with uncertainty: he’d sit in an inconvenient place, and suddenly leap across to “attack” or “bat at” my feet as I walked past. I thought I was the only one to whom he’d react in this way; clearly, he sensed danger in my Canadianness. Eventually, we realized other visitors witnessed and experienced the same thing. I admit I was a little disappointed. Basil is a well-loved cat, and he knows it. He’s lived in the U.S., Germany, England, and Australia. Through all of the moves, an important change over time has been the availability of a backyard, an open space into which Basil can roam and monitor his domain. After a number of visits with friends, Basil and I have come to an informal yet “mutual and beneficial understanding”: I ply him often with canned tuna, and he agrees not to draw blood from my legs. It’s really quite simple, but I know he’s free to change the terms of the agreement at any time. Basil is now 16 years old, and he’s beginning to show signs of his age: overall appetite has diminished, he’s slowed down, and he’s sleeping a lot more. But tap a fork against a can of tuna, his eyes light up, and he’ll rush into the kitchen for a round of “furry figure-8’s” around my legs in anticipation. Thanks to MB and DZ, for giving this hobo a place to stay, and for trusting me to ensure Basil’s well-being over the years. Basil, I know you don’t trust easy, but when you finally allowed me to pet you on your fuzzy head, I knew it was a big deal; I just never realized I’d learn something new about my own trust issues from a cat. This photo-book is for you all, a family of three. 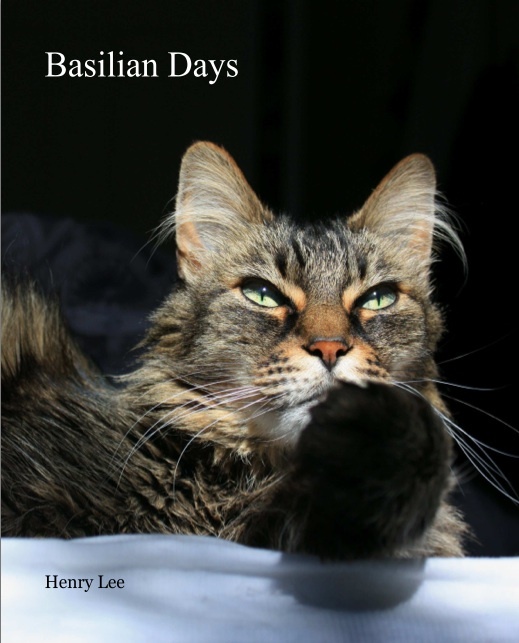 I produced and published the photobook, “Basilian Days”, in June 2013. This post appears on Fotoeins Fotopress at fotoeins.com as http://wp.me/p1BIdT-48G. PostScript: Basil passed away in Sydney, Australia on 18 December 2015 after 18 years, surrounded by hairless bipeds who loved him. Some of the best friendships are with animals.